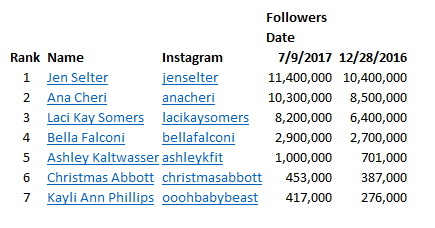 Anyway, Jen Selter is still leading the pack with an incredible 11.4M followers as of today. Although she’s in second, Ana Cheri seems to be coming on strong. She has 10.3M followers, up substantially since the last time I looked. That makes me think within another month or two, Ana will pass Jen in popularity. I can see why. Ana has been posting some racy photos lately. I updated her page with a few examples of what I’m talking about. But… I need to add a few! Looking at Andreia Brazier today, I think it’s safe to assume she’s always been a pretty gal. She says that she’s always been fit, but her journey to a muscular, fitness model physique took quite awhile. She spent almost ten years in the gym lifting weights and training before she started a real training split and started paying serious attention to her nutrition. That combination proved to be the key, and she began transforming her body. Andreia does follow a carb cycle diet, where she eats several days of low carbs followed by a refeed day of high carbs. This type of cycle tends to keep the body aligned with burning carbs and fat, hopefully sparing protein and muscle as it leans up. We are still sort of “stuck” on the Olympics. It’s hard not to be terribly excited about all the athletes who are about to fulfill their dreams this summer. Laura Trott is one of them. Laura is a British cyclist. Although she is only 19 years old, she has been biking since she was very young. She doesn’t really do sprints, she is mainly an endurance rider. She won the Women’s Omnium in the 2012 World Championships. And she won the 2011 and the 2012 UCI Team Pursuit. Laura admits that distance cycling can be painful. Ignoring the potential for crashes and pile-ups, the lactic acid burn is enough to drive mere mortals to tears. But she just laughs it off, saying that she enjoys the burn, and embraces the pain. In theory, athletes who compete in the Olympics are amateurs, which means they don’t get paid for their sport. But the definition gets stretched a little, when athletes who generally do get paid to play decide to take one for the team and enter the Olympics. That has little or no effect on our opinion of how hot certain female athletes are. By looking at those impossibly perfect abs, you would never guess Olya Haidner is a mom. Things got pretty much out of control during both of her pregnancies, and she gained fifty pounds both times. She was always active as a child and young adult. Olya was actually a professional ballroom dancer at one point, which obviously places some very unique physical demands on the body. So this gave her a good solid base to work with when it came time for losing weight. Vanessa Rahn is a beautiful and feminine gal who manages to carry a lot of muscle. Considering she has only been training for about four years, her physique is really impressive. Vanessa is 26 years old. She stands 5’5″ tall, competes at about 132 lbs, and has a fairly dark complexion. Vanessa tends to compete in bikini competitions, but looking at the size of her arms and the sweep of her quads, it’s obvious why she does fitness or figure shows as well. Vanessa enjoys interviewing contestants of NPC shows. She has that outgoing, gregarious personality that seems to make the people she interviews feel at ease and open up about how they are feeling about their win, what their diet, exercise, and contest prep program was like, and what they intend to do in the future. We took a look at Brittany Beede a couple of years ago- back in 2010 in fact. Yes, she is the WWE girl who was trained by MMA giant Brock Lesnar. What a crazy body this beauty has. She is 5’3 and about 115 lbs soaking wet, so she is fairly petite. But as you can see in this video, she has curves in all the right places. She has an impossibly skinny waist. Ladies do not get tiny waists like that by yo-yo dieting, and only staying in shape for parts of the year for contests. This gal has been rocking the hardbody for years now, and her complete devotion and discipline to her diet and training regiment are both notorious and very evident.